Chris Streveler wasn't even born the last time a pure rookie quarterback opened a CFL season as a starter. Hall of Famer Anthony Calvillo, currently the Toronto Argonauts quarterback coach, was the last player to achieve that in 1994 with the expansion Las Vegas Posse. Streveler, 23, will be under centre Thursday night when the Winnipeg Blue Bombers host the Edmonton Eskimos. Streveler finds himself on the field Thursday thanks to crazy circumstances. Starter Matt Nichols suffered a knee injury last week that will keep him out four-to-six weeks. Winnipeg had signed veteran Darian Durant to be Nichols' backup, but Durant abruptly retired before the start of training camp. The six-foot-one, 211-pound Streveler threw for 6,081 yards and 54 touchdowns over two seasons at South Dakota while rushing for 1,543 yards and 20 TDs. He was 10-of-10 passing for 140 yards and a TD in Winnipeg's opening exhibition game — a 33-13 win over Edmonton — but completed just 3-of-9 passes for 44 yards with a touchdown and interception in a 34-21 loss to B.C. "I wouldn't say it's daunting," Streveler said. "It's a really exciting opportunity. "I don't think we're going to be out there playing conservative. (Offensive co-ordinator Paul LaPolice) is going to call the plays he thinks are going to give us the best chance and that's how we're going to do it." But with Nichols out, it will be up to a Winnipeg defence boosted by the addition of linebacker Adam Bighill to cool a Edmonton offence led by Mike Reilly, the CFL's outstanding player last year. 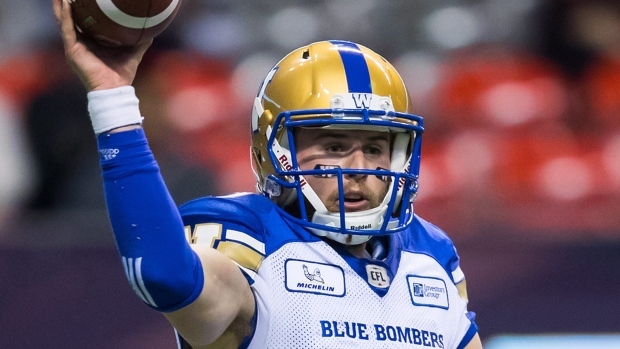 Reilly, who had a CFL-best 5,830 yards passing last season, will be without two big targets. Brandon Zylstra (100 catches, 1,687 yards, five TDs) is now with the NFL's Minnesota Vikings while Adarius Bowman (120 catches, 1,761 yards, nine TDs in 2016) will play for Winnipeg. Veteran linebacker J.C. Sherritt returns to Edmonton's defence after suffering a season-ending ruptured Achilles in the Eskimos' first game of the '17 campaign. "It's been a long time coming," he said. "I felt like I was ready, I had prepared to play in the Grey Cup had we made it but unfortunately we didn't. "It's just a great, great feeling to have the ability to prepare for a game and know that you have the opportunity to go out and be with your teammates." Steveler might be athletic and have a strong arm, but the defences he saw in pre-season will be vastly different now. Winnipeg's offence features versatile running back Andrew Harris but Edmonton has a huge edge at quarterback with Reilly.